Florida's afternoon rain pattern started in May this year rather than in the usual month of June. Since we have been in a severe drought now, for about umpteen years, the rain has been a welcomed and refreshing element in spring. 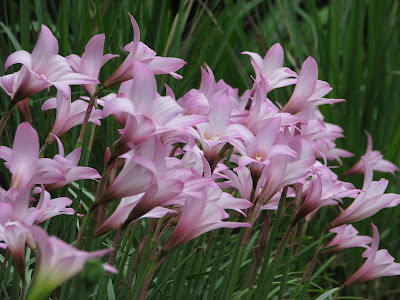 Rain lilies, Zephyranthes grandiflora are a no-nonsense little addition to the garden sporting erect, thin, green leaves visible all year long. When those first summer rains begin, towering just above the greenery, shoots several slender buds that open up for a day or two then disappear. Needless to say, the lilies are blooming early this year. As the rains continue the plant repeats the pattern consecutively creating more buds and blooms providing the prettiest patches of pink (they do come in white too) all over the garden. Their flowering ability must have something to do with the warm temps of the soil, too. It's a guess on my part but I'm figuring it that way because they don't bloom when it rains in the winter. My initial rain lily came from my sweet neighbor across the street. She has given me sooooo many varieties of plants over the years. Love her. 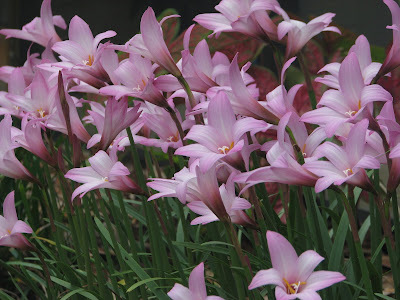 As my rain lilies have multiplied I've been digging up the bulbs and transplanting them to every sunny spot that needs a little pick-me-up of pink. As happy as I am that mine are more numerous than years prior... have a look at my neighbor's in the above photo. Since the middle of May hers have been putting on quite a show stretching about 100 feet across the entire front of her garden near the street side. I'm pretty sure I get to enjoy them more than she does because of where they are sited. And to think she was so worried about them when the peacocks were daily trampling them this winter. You would never know it today. The Rain Lilies are gorgeous, Meems. Glad you are having alot of rain this year. Amazing how one year can be so different from the next. And that always does effect what grows well and what does not. You have plenty of Rain Lilies.. I'll bet that your neighbor doesn't have HALF of what you grow in your yard... I like your balance of all different kinds of things. Thanks for sharing your lilies.Ours are just getting started. Meems I just love rain lilies too. I got mine one day going to work. I passed by this little house and saw a flash of pink in the corner of my eye. I stopped my car and reversed, and my eyes just popped open wide. In front of this house in a tiny garden where these rain lilies were dancing in the sunlight. I stopped and got out of the car and knocked on the door. A lady answered and I told her that I was passing and her beautiful pink flowers caught my eye. I asked her what they were and she said she was given them by someone who worked as a gardener and she said that she didn't know the name only that they flowered after the rain came. She asked me if I wanted a few and I promptly accepted. She was delighted that I wanted some. She pulled a few up and I placed them into a disposable cup. I thanked her and hurried off to work....I was already late. I placed them on a wet paper towel in the cup when I got to work and couldn't wait to get home to plant them. They have multiplied and are just a joy to see. I later found some white ones growing on the roadside in the countryside. So I pulled some up and planted them in the garden. We also have the tiny yellow ones growing wild in fields and on the roadside. They make a great ground cover and a border. Meems, They are wonderful and pink. I like pink flowers very much! How nice that you get to borrow the view! Whatever happened to the peacocks? Are they gone? Those are so pretty and lovely! Your neighbor's mass planting is so gorgeous, too. You are both great gardeners. The other day, I think you mentioned you've been gardening in the same place for 20+ years? I've only been gardening at this home for 4 years this fall and I can only hope for such a great garden as yours (though different plants with the zones) in another 20 years! Meems, I wish I could grow these beauties. 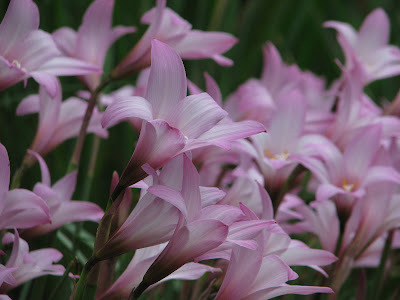 They remind me of resurrection lilies that I can grow but they only bloom one time rain or shine. Did I miss the capture and removal of the peacocks? I'm pretty sure you could grow them as an annual where you are... I've heard of some northern gardeners putting them in containers and overwintering them. Thank you. Yay, I'm glad you have them too. It will be exciting to see yours blooming. My neighbor has quite a variety of plants she brought here from south Florida when she moved. It is pretty amazing. She has generously shared so many with me over the years. I can see it all now. You and your friendly smile would win anyone over. We gardeners can cause traffic problems sometimes when we spot a plant or flower that catches our eye. :-) I'd love to see those tiny yellow ones growing. Are you sure you like pink? ... This pink is very different from your PPPP. :-)... but admirable all the same. My neighbor's view even catches my eye from the inside of my house as I walk past my front windows. It is a treat to have her for a neighbor because she is a lovely person. The fact that she gardens, too, (and she's almost 80 now) is a double blessing. The neighbors got together to hire a trapper in hopes we'd catch them before the brood produced more little ones.All six were trapped and released by a professional trapper. It took about 2 months for them one by one to succumb to the bait but finally the last male was trapped about 3 weeks ago. Are your resurrection lilies also called Bella donna lilies? There may be several names for them but I'm wondering if you have the same ones I do. I didn't publish a separate post about the capture of the peacocks... so, no, you didn't "miss it." I just kept folks informed as they inquired. Please see my reply to Island Rider in this comment section for the latest update. (I do miss hearing that male call from a distance- but don't miss their trampling habits). I must get some Rain Lilies...These are really putting on a show!! I was just up in Massachusetts: the rhododendrons were in full bloom, and about the same color. This is one of the first things I wanted to put in here, and I didn't do it. Do you think I could plant them now Meems? What a beautiful sight. I had no idea these little beauties existed until one showed up in my yard after our rains in Florida started. I sent a picture off to Penny at the Tribune and she got it identified for me. Of course I wanted more of these and now that I know they come in pink I really want those too. What I found curious was how it got to my yard. Do birds drop bulbs? Or do these seed and they blow around? I dug mine up before the mowers got it and found 3 more bulbs in the same area. They multiply easily I take it? It is a Florida native I was told so I am wondering why our nurseries don't sell more of them. Very pretty en masse. Thanks for sharing the pictures and the story of your wonderful neighbor. Gosh they are just beautiful. I had to come over cause I missed ya. I wanted to see what was blooming in your garden. I'm not disappointed. Hope you are well and so glad you and we are getting the much needed rain. I'm sure not complaining but we did get 5 inches in one day last week. Shew--that was a lot of rain but the garden just loves it. what a wonderful display of your lilies. the veggie garden didn't like all your rain but the lilies sure did. they are really something en mass like that. They are a lot of fun. I think they would grow up there for you, too. Now THAT would be a beautiful sight. I don't think it is too late. You might even get a bloom from them with the June rains. Let me know (e-mail me)if you'd like for me to send you some. I'd be happy to share. That Penny is a smart one... she can I.D. anything. Once rain liles have flowered a seed pod forms and I do think they easily transplant from the seed pods (not sure though)as well as the bulbs. That might be why they are found in the grass. I don't think they are a native. I never see them in nurseries... not sure why. It has been almost a week since we've had any rain. Boo. So strange is this weather. 5" is a lot in a day but you are right the garden loves it. I am well... thanks for coming by to check. We should have harvested some of these for you to put in pots. There just wasn't enough time to get it all done. 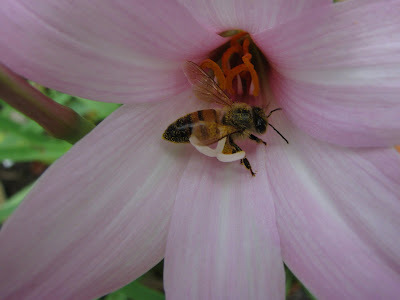 Gosh your blog makes me smile...the lilies really are splendid! Your garden is so full of inspiration. I've been wanting to ask you about the bleeding heart; is it at all invasive? I read somewhere that it is native to Africa but I thought there was a variety native to Florida. It is so gorgeous! i love them...just started to bloom out here in Charleston, SC....your pics are beautiful! Those are great; I can't wait until mine start to bloom. I managed to find some rain lilies...although only white...at a garden show. But seeing your beautiful profusion makes me think mine are not so happy. Maybe it's too dry here. Love your blog. Your garden been such an inspirations for me. Wondering if I saved rain water in a barrel , if I used that to water them, will that water make them bloom? I live in Iowa and I over winter them in pots in the garage. I love the rain Lilly's, but we have had a drought last year and it doesn't look good for this year. I am new to your blog, and I have spent hours here admiring your garden. I know our zones are very different but, every gardener enjoys looking at others gardens. Yours is extraordinary. Thank you.